I’m thrilled to announce a significant investment in DataCamp this month, led by Spectrum Equity, that will support our continued and rapid growth in 2019 and beyond. DataCamp enables companies to build data fluency across their organizations with hands-on courses taught by experts in the field. We’re positioned for major expansion across DataCamp’s data science and analytics curriculum, providing a much-needed career-long resource for learners at every level. In 2019, we’re doubling the total number of Courses, Projects and Practice exercises on the platform. We’ll continue to grow our Python and R content, while also adding content in critical-need areas like SQL, Spreadsheets, Data Engineering, Deep Learning and AI, and more. DataCamp’s platform is getting smarter and more personalized. Users will gain insight into their current skill level, guidance on where they need to improve, and personalized recommendations for Courses and Projects to take next. We’re also improving our interactive feedback system, so hints and correction messages will provide even more relevant feedback, exactly when you need it. 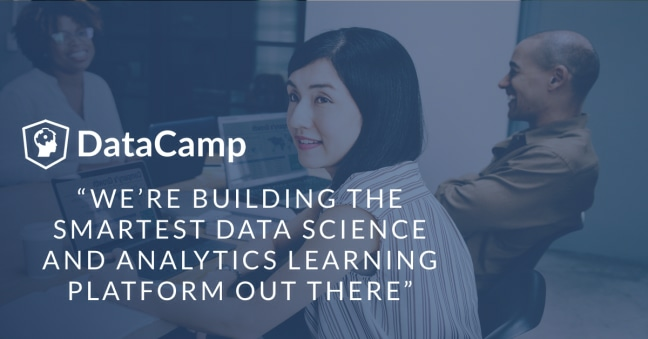 DataCamp gives modern companies a scalable learning solution to build data science and analytics capabilities for better decision making. Companies will have access to LMS integrations and a reporting API, and we’re making it easier to manage teams of all sizes on DataCamp with Team Manager roles.